Every year, when the temperatures go down, we see an increase in the sales of space heaters. And for a good reason. They are an excellent source of warmth during those cold days. However, you still want to save money on energy after you buy one. So, what is the best way to find the most energy efficient space heater? Well, going online and reading about it, of course. So, we are here to provide you with some of the best electric heaters for sale. Of course, finding the most energy efficient space heater is no simple task. After all, you don’t want just to spend less electricity; you still want to be warm during winter, not to mention that there are various different things you have to consider. For example, the cost of this product ranges from less than 50 dollars to well over 500. And, believe it or not, there are various features you would have to consider too. But, let’s start the article with a bit of fundamental information about space heaters. Are you looking for a compact heater that will help make the atmosphere in your living room cozier? Well, then our top pick for you would be this Duraflame stove. It offers everything you might want. It is compact, beautiful, and effective. This charming stove doesn’t take up a lot of space as it’s dimensions are 21×10.8×22.8 inches. That makes it easy to find room for in your living area. And, since it is less than 20 pounds heavy, you can move it around as you please, without any strain. The artistic design combines the ingenuity of modern technology with the beauty of antique design with realistic flames. This design allows it to provide both the heat and the coziness to your living area. We also love that you can have the flames effect on without actually heating the area. So, you can get the visual effect without denting your monthly budget. If you use it as a supplemental unit, this 4,600 heater will heat up to 400 square feet of your space. And, it also offers some of the most important safety features you might want. First of all, it offers excellent overheat protection. The heater of this unit will instantly turn off as soon as the temperature rises too much. It will also shut off if it ever falls over to protect your home. Also, since this stove is meant to be used in the living room, it was designed with everyday safety in mind. That means that there are no exposed heating parts and no surfaces that get too hot on the outside. If you are trying to save some money on heating bills, this stove has exactly what you need. It offers a zone heating feature. Zone heating will let you direct the warm air into the rooms that you actually use. That way, you can avoid heating up the rooms you never go to. One of the things people worry about when using similar “fireplace” heaters is the effect the heat might have on the floor. So, of course, we simply had to test it with our hardwood floors. While the floors did get warm, they never actually became hot, and there was no damage. Even at the first look, you know that this heater could be the best solution for people who are trying to save space. The minimalistic design and energy effectiveness are there to hit just the right spots. The stylish look of this panel heater means that it will fit in perfectly wherever you put it. Its dimensions are 27.3×9.75*22.5 inches, and it weighs in at only 10 pounds. That means that almost anyone can move it around with no effort. And, you can even simply push it around on its wheels, which makes it perfect for homes that sometimes need the extra warmth in specific rooms, or for those winter days when you have guests coming over for the night. You can also take this radiator and mount it on a wall to preserve space if you don’t feel like moving it around your home. This small, yet powerful heater delivers 5,120 BTUs of power to help you warm your room up. The power it offers means that it will easily heat up a room of about 300 feet if you are using it as a supplemental heater. Of course, you can easily change the settings to your liking. First of all, you have two settings when it comes to energy expenditure. You can set it to work on 750 watts or 1,500 watts. And, right next to that control you will find the thermostat dial. With it, you can set the temperature to your liking. And, of course, it offers the safety features we were talking about. The thermal cut off is there to prevent overheating. And the tip-over switch on the inside will shut the unit off if it starts wobbling too much. It also comes with the setting that will prevent the pipes from being frozen during the cold days. The anti-freeze feature is there to prevent the room temperature from dipping below 41 degrees Fahrenheit (5 degrees Celsius). And lastly, it works without making a sound. After all, it doesn’t have any moving parts to make noise. That means that you can sleep without interruptions from your heater. This heater uses something you don’t get to see all the time. It uses the technology of infrared heating. That means that it can heat your room up almost instantly and it doesn’t spend too much energy. The dimensions of this heater are roughly 13x11x16 inches, and it weighs in at 23 pounds. The innovation behind this product is such that the manufacturer claims it doesn’t actually heat the air up. Instead, this heater will only heat up the objects in the room and thus require less power to work. So, naturally, that type of a claim really got us curious about the product. After all, the concept sounds rather futuristic. But, does it really deliver? Well, the first thing we should explain is how it actually works. The infrared radiation actually heats up the metal-wrapped quartz. Then, the fan blows the warm air into the room. However, the infrared heating heats up the objects in the room as well. And, we had to wonder why that would be an advantage. Well, according to the manufacturer, if you just heat the air up, a bit of draft will cool the air immediately. Not to mention that the warm air will rise to the ceiling. On the other hand, if you heat the objects in the room up, they will serve as heaters themselves. Also, the room will be warm for longer, and the temperature will be evener. This heater also ranks highly in terms of safety. It has no heating elements out in the open that can potentially cause a fire. The unit won’t overheat thanks to the overheat protection system. It also has a tip-over switch to turn it off the moment it falls. And that is a feature you can easily test, so we, of course, did. And it works perfectly. Lastly, it also has an automatic shut-off that will activate after 12 hours of work. This way, you can’t accidentally leave the heater on for too long. The surface of this heater doesn’t get hot either. So, if you have kids or pets, you don’t have to worry about them burning themselves by touching it. It also offers some quality-of-life features that we simply love. For example, it actually has a built-in humidifier to avoid drying the air up. It also comes with a remote controller and an excellent control panel. You can quickly set the temperature and see the details about how the heater is working. The humidifier doesn’t last as long as the heater and it might break down on youIt is not a good looking heater. For all of those homes that don’t have a lot of room to spare, but need a bit more warmth in their living rooms, we would recommend the Stiebel Eltron CK 15E. This 1500-watt fan heater will help you heat the room up, and you can easily mount it on your wall. You can even set it up right above the heater you are already using for your space. This unit can be a great heating addition to your bedroom, office, bathroom, or other smaller rooms. The design of the heater is very attractive as well. Meaning that you won’t have to try and hide the unit from guests. The dimensions of this heater are 13.25×4.8×18.14 inches, and it weighs in at only 15 pounds. If you plan to use it as the main heater, it should heat up a room of up to 150 square feet. In order to create an even flow of heat in the room, this heater will pull in cold air from the top and pump the warm air out of the bottom of it. That will not only keep the room warm, but it will actually warm your floor up. And that is something most wall-mounted heaters simply don’t offer. Also, even though this unit comes with a fan, the operation is surprisingly quiet. So, you can use it in your bedroom without worrying about waking up. The fans, when active, work at only 49 decibels. This heater also comes with overheat protection. As soon as the temperature reaches the goal, the power will cut off. And, it doesn’t really require any type of tip-over switch since it simply can’t tip over. However, you should make sure not to leave flammable materials under this heater. Another thing we should mention is the excellent warranty you get with these heaters. All CK units come from a factory in Germany, and Stiebel offers a 3-year warranty on them. And we all know that German products are famous for top build quality. The controls are also very intuitive. You can use the thermostat on the unit itself, or even a wall thermostat for rooms bigger than 215 square feet. If you plan on not being around for a while, you can set it to the frost protection mode. If you do, it will keep the temperatures above freezing to avoid any damage. Sometimes, it is just not enough to have a heater that will help you warm the room up. Sometimes, you just want to have a really good looking unit too. And this is where Lasko 6435 comes in. This oscillating ceramic heater is probably the best choice for those who are out to find a designer series heater. Not to mention that it is actually an incredibly useful unit for anyone to get. The decorative metal base of this heater will go perfectly with designer pieces in your home. And the size of the unit makes it easy to place wherever you want it. The dimensions are 8.25×8.25×16.05 inches. Choosing an oscillating heater comes with a lot of benefits, and this particular model makes it even better. First of all, it is incredibly simple to operate. There are no difficult setup steps you have to go through. Just read through the manual and turn it on. Turning on the oscillator will help the warmth spread around the room evenly. And, you can easily do it with the use of the remote control. You will also be able to set the timer for the heater. The timer will allow you to control your energy expenditure when you are not around. Not to mention that you won’t have to worry about forgetting to turn the heater off when you leave the room, especially if you are using this heater in your garage or working area. The heater also comes with the overheat protection so it will turn off if it gets too hot. The remote comes without a screen on it. That means that you can’t see the settings as you change them. The heater will also cool down in a very short time after you turn it off. That means that it won’t keep the room warm after it shuts down. We all have to admit that one of the most surprising moments in the world of heaters lately was the unveiling of Dyson’s new bladeless fan technology. And this technology allows this heater to be equally good at cooling as it is at warming a room. And we have to say that almost everything about this fan is fantastic. The needle-like design allows it to look professional and modern, and it comes in black and white. The actual bladeless fan works by propelling air through the large cavity. This design allows Dyson to remove the danger of blades altogether. After all, we can only imagine how stressful it can be to have a child run towards a working fan. It is also very lightweight. In fact, for a heater that is 24 inches high (the dimensions are 8.5×7.5×24 inches), it is incredibly light. It weighs in at only 6 pounds. And, this heater doesn’t only look cool. Even when you are using it at higher temperatures, the surface remains relatively cool to touch. It, of course, also boasts excellent safety features. That includes the overheating protection and the tip-over switch. And, when speaking of overheating, there is another bit of information we should mention. To avoid the unpleasant smell of burning dust, the heating part of this device never goes above 390 degrees. And the fact that you can use it as an A/C unit during the summer is great too. 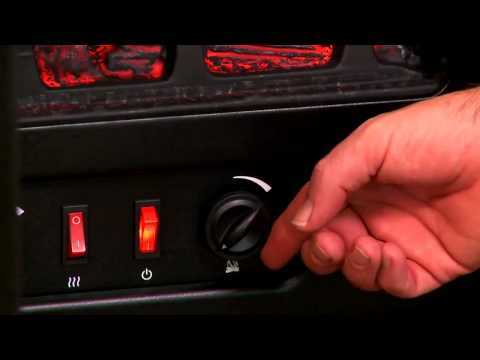 You can simply use the remote and flip between the heating and cooling modes on this unit. The bladeless fan even comes with ten speed levels for you to choose. The unique design of the fan allows it to run incredibly silently – at least at lower speeds. If you kick it up to higher speeds, it can actually get rather noisy. However, you are not very likely to do so as it can actually blow air with a lot of power at higher settings. You can also activate the oscillating feature to get the temperature spread out more evenly. However, do make sure to keep the remote. If you lose it, the only control you have left is the power button on the heater itself. The temperature settings are simple and can range from 32 to almost 100 degrees Fahrenheit. However, it won’t just push out that temperature out of the fan. Instead, it uses smart technology to adjust the output depending on the room’s temperature. It is very expensive. In fact, it is four times more expensive than some of the other entries on this list. If you are thinking about buying an infrared heater, Lifesmart heaters are definitely one of the options you should consider. This heater works by using the infrared heater to heat up its wrapping which then provides the heat output. And, Lifesmart didn’t stop at one heating element. This heater actually boasts six elements that provide faster heating. The dimensions of 13×16.25×17.5 inches make it very compact. And the weight of only 24 pounds means it is very lightweight for what it does. This Lifesmart heater also comes with casters for easy gliding so that you can move it around with no effort. Upon testing this heater, we found that the infrared heating works perfectly. You can easily target the area of the room you want to prioritize warming up, or even yourself. And, drafts don’t actually affect the performance of this heater. We also love the design that is reminiscent of an antique wooden cabinet. You can use it to decorate any room in your house, without having it stick out visually. Lifesmart doesn’t disappoint when it comes to safety features either. Not only is the exterior cool to touch, but it also has the tip-over shutoff and the overheat protection. And, if you have kids, you are probably going to like the fact that it has a child lock on it. We also love the interface on this cabinet/heater. It is very intuitive and has all the useful options. You can choose between 3 different heat settings including the eco mode that saves money. The large display also means that you can easily keep track of the temperature settings even while using the remote. Intuitive controls, both on the on-heater panel and the remote control. It doesn’t actually heat the air as it is an infrared heater. Some users dislike that. The very first thing to think about is the technology the heater uses to heat the room. Some types of heaters will heat the entire room up, while others won’t. Those are usually just there to immediately heat the person sitting close to it. Heaters use convection heating, radiant heating or micathermic heating. Convection heaters are generally the most common heaters in the world. They are great for heating entire rooms and keeping them warm. They work by circulating the air through their system and heating it up. A majority of these heaters will include a fan to help the air flow around the room. Some also use ceramic disc elements to be safer to touch. The actual heaters are inside the systems, and the ceramic disks never get too hot. These are generally a great choice if you have small kids running around. Radiant Heaters are a great choice for those who require spot heating. Since they don’t circulate the air, they instantly heat the area that is in their close proximity. That makes them popular for smaller rooms. However, a lot of people enjoy them in open spaces. For example, if the heating in your workshop is down, you can use this to keep yourself warm even though the overall temperature of the room isn’t significantly improving. Micathermic heaters use the technology behind both radiant and convection heating. Their design allows for natural convection and air circulation, while they generally radiate heat. This way, they can heat up the entire room, but without picking up dust. The big question is figuring out what you should look for. So, of course, we will break it down for you to help you make your decision. Some of the things you should keep in mind are size and power, safety, timer, energy efficiency and many others. Another thing you should consider when it comes to space heaters is the size you should choose. You should definitely consider the size of the heater when it comes to energy expenditure. Remember, while having a space heater brings a lot of comfort, they can cost you a lot. So, make sure not to take a heater that is too small to warm your room up. However, you shouldn’t waste money on a heater that is too big for the room either. That way, you would just spend way too much money for heating a small room. To make it simpler, you can use a very simple equation to figure out how much power you need. Simply calculate your room’s surface in square feet and multiply it by ten. That is how many watts of power you will require to heat your room properly, on average. So, if you want to heat up a 200-square-feet-room, you could use a 2,000-watt heater to do so. Of course, the technology in your heater might differ, so bear in mind that it might take a bit more, or a bit less. And, if you are using it as a supplemental heater, the area is much larger. All heaters are a potential fire hazard. After all, they all get very hot. So, of course, you want to buy a heater which features safety measures to ensure your house doesn’t burn down. So, the first thing you should look for is a sensor that will shut the heater off if it starts overheating. And, if you can, a system that will switch it off in the case it falls over, especially if you are taking a taller model and have kids in your home. Any damage to the power cords can also cause incidents. So, make sure you have the right power cord. You should also inspect the cables of your heater every now and then to stay safe. And, don’t use extension cords with your heater. Another thing you should check up on is whether or not the heater has a label of a testing laboratory. This label will confirm that the heater meets the safety standards. One thing that might surprise you about heaters is how many features they can have. So, we will cover the most important ones – at least for some people. Timers: Having the ability to program the heater and have it turn off or on at the exact moment you want will help you save money. You can set your heater to turn off when you leave for work and turn back on just a bit before you come back home. This way, you don’t have to spend money during the day, and you still return to a warm home. Wheels or Handles: If you are looking for a lightweight model, you might plan on moving it around. If that is the case, wheels and handles can be your best friends. Automatic Oscillation: Oscillating will help your heater distribute the heat around the room. Heat Settings and Remote Control: One of the features you definitely want is the ability to change heat settings. You want to switch between High and Low heat, set exact temperature, or even have money saving modes. And, well, the remote is not a must-have, but it is definitely neat. Cooling modes: If you plan on using a heater with a fan, you might want to have one that can cool you off during warmer days. Our top pick is the Duraflame DFS-550 electric stove. It represents an excellent price-quality ratio, and it is possibly the best ceramic space heater you can get. On the other hand, DeLonghi HPM1500 is the most economical space heater. Dr. Infrared is an excellent low energy space heater which you can use to target the areas you want to warm up easily. The Stiebel Eltron CK 15E could be the best space heater for large room areas. And Lasko 6435 is for those who are here to choose an energy efficient space heater. So, as we said, it is up to you to decide which of these heaters is the best choice for your home. What’s better than having a nice hot shower in cold weather? Check out this article and get your family a good hot water heater.